Boston Handmade: Do you know about Ready Made? Do you know about Ready Made? 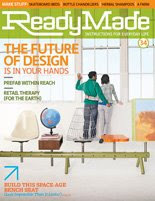 ReadyMade Magazine has launched their magazine online! If you haven't had the chance to browse one of their issues, check out this month's issue free on their website. ReadyMade is a bimonthly print magazine for people who like to make stuff, who see the flicker of invention in everyday objects — the perfectly round yolk in the mundane egg. You'll find tons of great projects and good-to-know info on everything house, home, and life related. Each issue is always a good read. This month, I particularly like the Custom Earth Bowls from Fluid Forms. They allow you to pick a location of choice, plug in the coordinates on their website, and then have a wooden bowl personally crafted to resemble the peaks and valleys of your chosen neighborhood! What will they think of next!